1/27/13 – Last June I was asked by a member of the math department at The Center School if it would be possible to bring in Chris Jordan to speak about his work “Running the Numbers.” I have scheduled an all-school assembly with Chris for 2/13/13. Center’s first TED speaker! It should be awesome! 2/14/13 Update: Here is a post I wrote about the event. 1/27/13 – Thinking about starting the Center Flatstock Project Year 3. Working on student artist recruitment first. 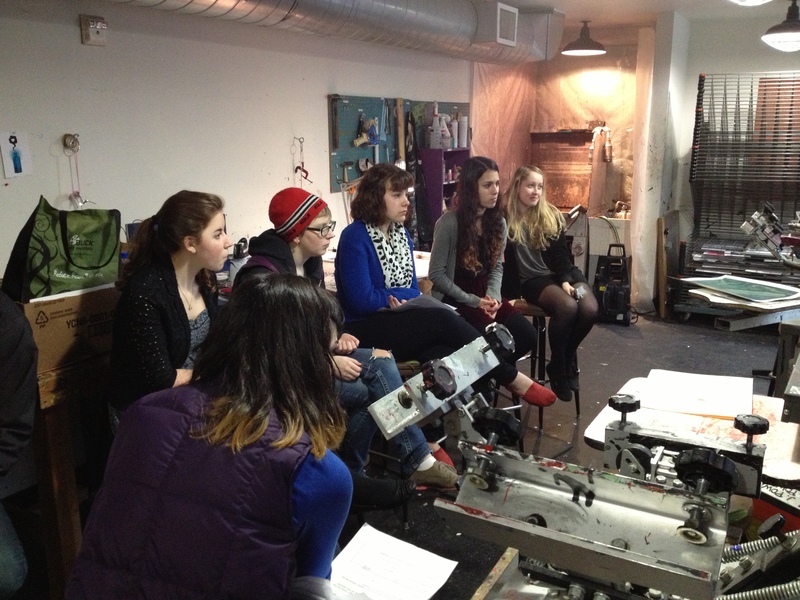 2/28/13 Update: I decided to jump in again and have a great group of students for this year’s Flatstock Project crew. 9/16/12 – I have been asked by one of the Center School math teachers to bring someone in to talk about business finance elements and the math concepts behind them. I have contacted Shunpike to arrange for a guest speaker. 11/30/12 Update: Andy Fife, the Executive Director of Shunpike himself came in to talk to Sheila Henneuse’s Algebra 1 class about the financial side of running an art business or arts organization. He was awesome, and those kids were taking notes! So cool. 9/8/12 –Back to school! I will be actively recruiting for a new volunteer arts liaison for The Center School this year, as it will be my 5th year in the position. Time for someone else to step in and carry the torch onward! 11/15/12 Update: I have found an excellent future arts liaison for The Center School! Sibel Golden M.A., LMHC, PhD, has a Freshman son at TCS, in addition to being a psychotherapist working within an Existential-Humanistic framework, integrating the creative arts. She recently received her doctorate at Saybrook Graduate School and Research Center. Her dissertation, is researching the experience of courage in the creative process of eminent artists. I believe she will be a great addition to the CSCA. 1/27/13 Update: The end of each year’s series culminates in a Summit. This year it is set for February 9th at SAM. It’s a free event. Registration is open to the public. I will be there! 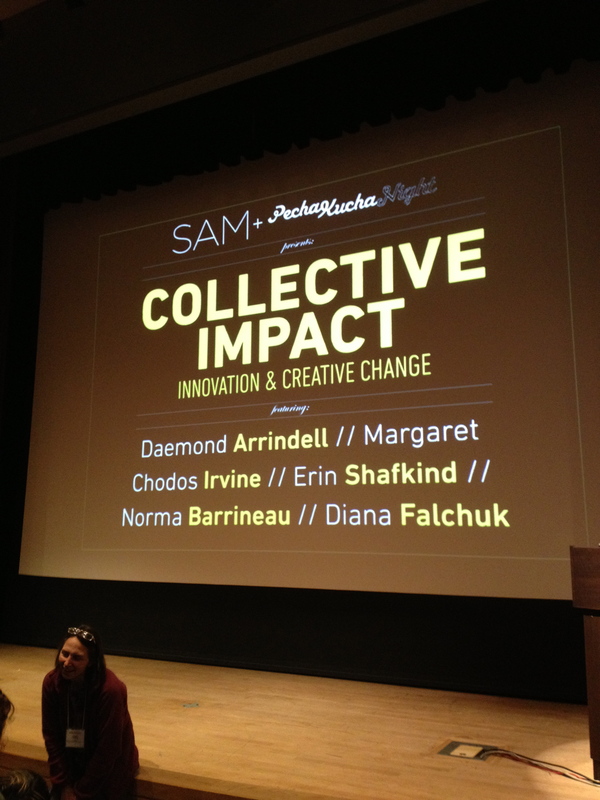 2/1/13 Update: I have been asked to be part of a Pecha Kucha line-up for the Collective Impact: Innovation & Creative Change part of the event. Oh boy! and yikes!! 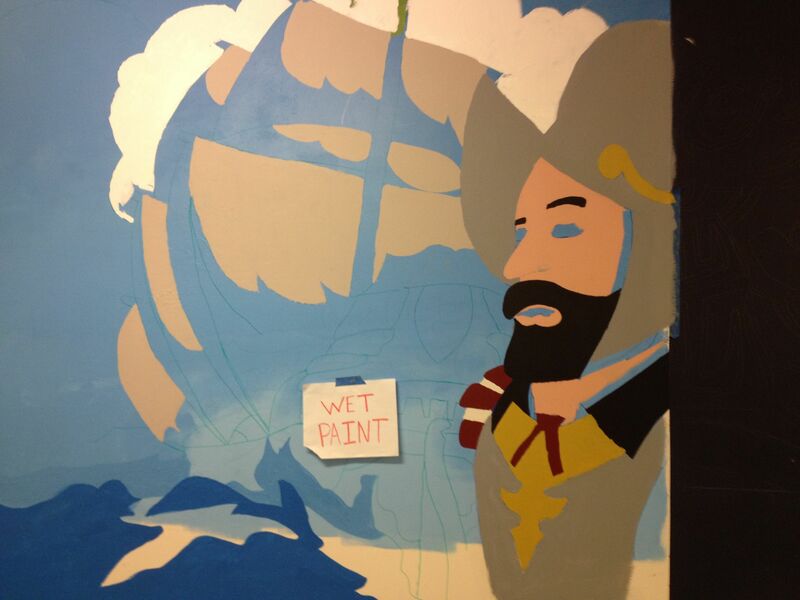 2/11/13 Update: Whew! I did it! The best part was being there to hear the other Pecha Kucha presenters: Daemond Arrindell, Erin Shafkind, Norma Barrineau, and Diana Falchuk. SO INSPIRING! 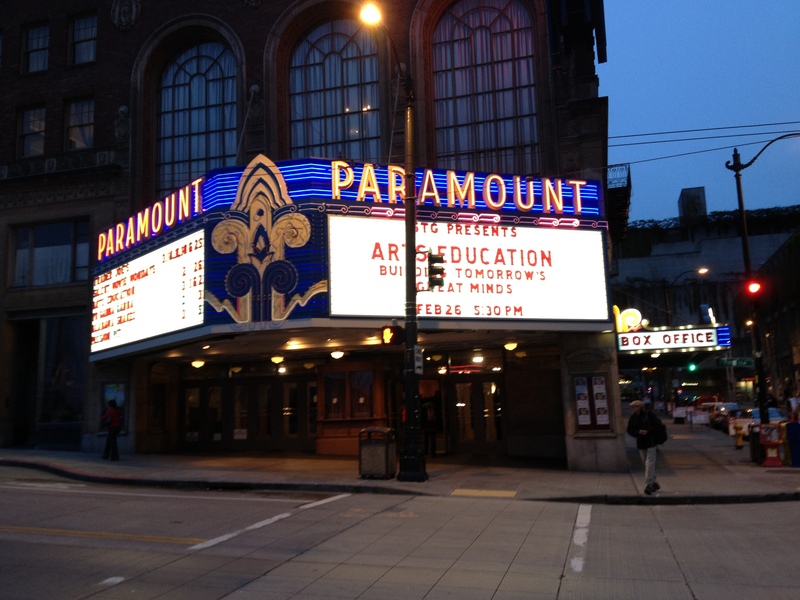 5/22/12 – I was invited to be on the Seattle Public Schools Arts Plan Representative Advisory Committee. Tonight was the first of four meetings to engage us – a group of artists, educators, parents, arts organization representatives and administrators – as stakeholders in the arts education plan being developed under the Wallace research grant. It should be an interesting group to work with. We will meet every two months till November. Check back for updates! 5/31/12 Update: The title of the the group has been changed to Seattle K-12 Arts Learning Collaborative based on the feedback they got at the first meeting. From Audrey Querns, Seattle Public Schools K-12 Arts Plan Project Manager: “The goal of this citywide collaboration is for all students in all SPS schools to have opportunities to learn through the arts, helping them be successful in school and in life.” You can check out the project website for further info. Audrey will be adding more content over the next couple of weeks, including the report on the March public engagement meetings. 1/27/13 Update: The proposal draft has been submitted to the Wallace Foundation, and the final proposal will follow soon. It has been impressive to watch the members of the collaborative in action: SPS, SAM, PONCHO, OACA. I have confidence that the proposal is groundbreaking in terms of bringing the arts into Seattle public school classrooms. I hope Wallace agrees and provides the requested implementation grant. More news to follow! 2/28/13 Update: SPS hosted an event for all those involved in the arts plan proposal process. Looking for a mural artist for The Center School Spanish dept. The Flatstock Project: Year Two. Working with a group of Center School students on creating posters to sell as PR/fundraiser for the school. The theme this year is NOW. The posters will be printed at The Vera Project print studio. UPDATE: The posters and T-shirts are done! We will be selling them during the Folklife Festival at the Seattle Center Memorial Day weekend – Friday through Monday, 11:00 to 8:00 each day. Our booth is in the Founders’ Circle courtyard. Come check it out! Update: Folklife is perhaps not the easiest place to sell art, but we still did pretty well and those that did buy your art were extremely enthusiastic. We sold over 40 posters and 32 T-shirts.We had a few return customers yesterday afternoon, and even a collector of “outsider art” who bought a print. It was also great PR for the school. I must have told at least 50 people, “yes, there really is a high school in the Center House…”Our next sales event will be the Center School Arts Showcase on June 7. Done! I observed one of the sessions. It’s not often you get to hear middle schoolers singing in Medieval English. Recruiting, facilitating, captaining and PERFORMING IN Pat Graney’s The Chair Spectacle for the Seattle Center’s Next 50 Celebration with Center School students and staff. Did it! It truly was a spectacle! Working with Center School Film 3 students on putting together a short video presentation promoting what makes The Center School a meaningful place for them to learn. Deadline = The Center School fundraiser (Ware)House Party on 4/28/12. Done! The film helped raise almost $10,000 at the event!